I’m here to suggest there are 8 tangible steps you and your partner can take TODAY to set a new foundation in your home – a foundation that you can both feel comfortable standing on as you continue your parenting journey. Start by identifying the aspects of parenting and discipline in which you DO agree. You’ll be more successful by identifying areas you agree on rather than focusing energy on the many areas where you disagree. Look for the positives. Identify the parenting strategies your partner uses that you appreciate. Do they use a respectful tone? Do they play with the kids? Do they have reasonable expectations of your kids? Even if all you can say with confidence is “I appreciate how much you love our children,” that is a positive foundation to build upon. After all, your partner DOES love your kids. And even though his/her parenting style may differ from yours, the discipline approach comes from a place of LOVE. This is not a time for blame or rehashing – this is a fresh start for everyone involved, so build on your commonalities. The greatest influence on our discipline methods is undoubtedly our own parents. Whether you agree with your parents’ discipline-style or not, the choices you make today as a parent are due in part to how you were raised. For those with negative childhood discipline experiences, these parents often vow to not repeat the same discouraging behaviors on their own children. Or conversely, (and more frequently) those who agree with the discipline techniques used by their own parents will repeat the same strategies and use the same language they internalized as a child. This justification for parenting choices is a slippery slope because you are taking your experience as a single person and applying it to an entire group of people. For example, you might hear someone say, “I never wore a seatbelt growing up, and I turned out fine.” Chances are, if this were the case, the same person problem wasn’t in a messy car accident either. This person’s one experience can’t be used to justify banning seatbelts because inevitably, someone is going to get into a car accident and need a seatbelt to save their life. In parenting circles, you’ll often hear someone say, “I was spanked all the time, but I turned out ok.” But the truth is we can’t let a single person’s experience justify spanking ALL children who come from a plethora of different backgrounds and who have different predispositions. Or when multiple scientific studies tell us it has a negative effect on children. And sure, this negative effect might be something as simple as a quick-temper or mild anxiety, but it could also create emotional trauma that is much deeper than you ever intended. If you find yourself using the “I turned out fine” argument to justify your position, I’d encourage you to really dig deep and evaluate where these feelings are coming from. 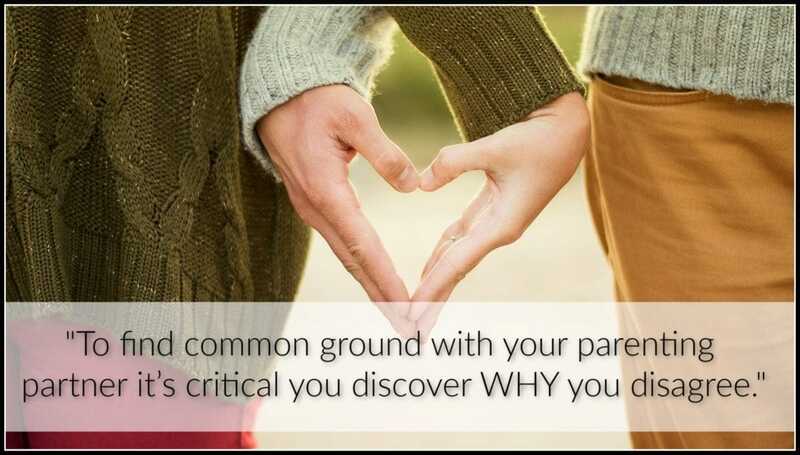 To find common ground with your parenting partner it’s critical you each do a little soul-searching and discover WHY you disagree. What parts of your childhood influence your perception of appropriate parenting techniques? Additionally, what parts of your childhood influence how you feel about your partner’s parenting techniques? With a little self-reflection from you and your partner, you’ll be well on your way to uncovering the surface of your deeply held parenting beliefs. Begin with the non-negotiables for your family. The non-negotiables are typically the health and safety rules (wearing bike helmets, driving before dark, etc.) and other areas your family values – education (homework before playtime) or respect (name calling will not be tolerated). Agree on the limits and expectations for the non-negotiables and clearly communicate those to everyone. Be sure you both follow through each and every time on the non-negotiables so your kids see you are a unified front. Remember that parenting is a marathon, not a sprint – and that requires we think long-term. Visualize your kids when they show up for their first day of work. Imagine who they’ll be when they have children of their own. What attributes do you hope your children will possess when they become adults? Compassion? Work ethic? Thoughtfulness? Respect? Motivation? Resilience? If you and your partner can agree on 3-4 words you hope describe your children as adults, you’ll be able to view parenting with a far-sighted lens. It’s about teaching your child to make the best possible choices in the future and learning from mistakes along the way so they can grow into well-adjusted adults. When you and your partner have a long-term goal of raising responsible, compassionate, respectful children, you have a framework to make short-term decisions. If you want your child to be responsible, should you drive his forgotten homework up to school for the third time this week or not? If you want your child to be compassionate, how should you respond when she admits to cheating on a test? If you want your child to be respectful, how can you model that for him on a daily basis? If you and your partner can agree on some long-term parenting goals for your family, the short-term decisions will be easier to make. It’s okay if you disagree on some discipline issues – but the key is not to argue about them in front of your children. Since 95% of issues don’t need to be solved on the spot, this gives both parents a chance to take a breather and decide on a course of action later. In the same way you shouldn’t disagree on discipline in front of your children, it’s vitally important you don’t pigeon-hole one another into good cop, bad cop roles. What message does a kid hear when mom says, “Just wait until Dad gets home?” A child hears that Daddy is the bad cop and is the only one capable of handling this situation. Or if Dad says “Mom is going to be very upset about this broken vase!” The child assumes Mom cares more about the vase than Dad does. Statements like these only reinforce a child’s feelings of viewing one parent as the “loving one” and one parent as the “strict one”. In reality, if you’re trying to present yourselves as a unified front, you should both try to be consistent in your reactions. Each parent should feel equipped and empowered to handle any situation that arrives when the kids are in their care without threatening the other parent’s involvement. In a similar vein, it’s important not to undermine your partner’s parenting decisions in front of the children. If your children see you have a lack of faith in the parenting decisions your partner made, they will undoubtedly share the same sentiments and behave accordingly. Set aside some time one night each week, after the kids go to bed, to discuss your progress. Take note of the issues that have come up most frequently and agree on a correction method to use from now on. Keep in mind that your goal is not to “win the battle” with your partner, but to find the most constructive plan to help your children make good choices—thereby reducing future misbehaviors and training them for adulthood. Again, this is not a time for blaming or rehashing, but rather a time to come together and map out a plan for your current parenting struggles. Celebrate the little successes you’ve made and the changes you’ve seen in your children and each other. If after some focused effort, you and your spouse continue to disagree on parenting and discipline issues, consider taking a parenting class together or visiting with an objective, third party resource – such as a family therapist. If you’re not sure whether an in-person parenting course or an online class is better for your family, you can learn more about the pros and cons of each type here. No matter what route you take, just remember, you and your partner are on the same team! While the task of solving discipline disagreements can seem daunting, these 8 strategies will put you and your spouse on the path to success. With these guidelines, time and effort, it won’t be too long before the big discipline debate is happily in the past. If you would like to learn more parenting strategies to help you on this journey, I’d love to have you JOIN ME FOR A FREE ONLINE PARENTING CLASS!